For senior citizens seeking to spend their twilight years in a peaceful and comfortable place, JSS Hiriyara Mane is the place to be. Built in the tranquil surroundings of Suttur Srikshetra, JSS Hiriyara Mane offers everything that an older adult needs at his age. The home is equipped with all the necessary amenities to ensure that there is comfort at every step for the inmates. The caring staff at home are well trained to take care of the inmates with love and affection. There are two senior citizens homes at Suttur, out of which one is a free home. 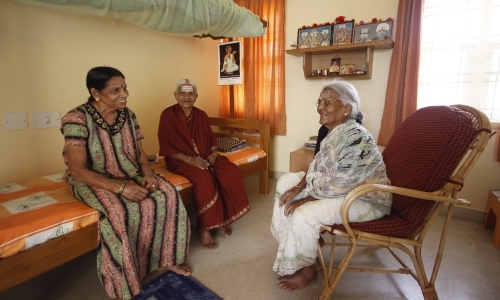 There is also a free home for senior citizens in Mysuru. JSS Medical Service Trust has set up a helpline for senior citizens in association with the Police Department and with grants from the Department of Senior Citizens and Handicapped Persons’ Welfare. The helpline has the objective of ensuring safety to senior citizens aged above 60 years and protecting them from any form of exploitation and maltreatment.